Our hand cut, aged Black Angus steaks are cooked over an oak fire, making our steaks. 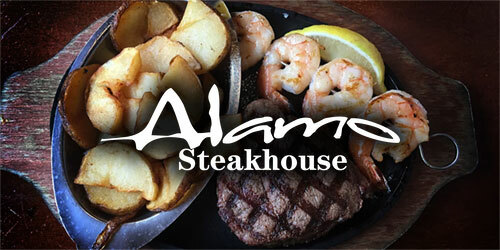 Locals have voted “Best Steak” for Alamo Steakhouse six years! A great location brings you fantastic Texas-style steaks and unique appetizers such as stuffed mushrooms and flame grilled oysters. Their menu also features mouth-watering seafood selections such as pistachio encrusted salmon and tuna with mango salsa. Forget about the chain restaurants and experience this local standout. Here at the Alamo Steakhouse, we believe in serving the best. We take our aged steak, hand cut it in house and season it. We then grill it over an oak fire to sear in all the juices and natural flavors. This makes our steaks tender and delicious. But it’s not just steaks we take such care with, we also grind our own burgers, make all our soups, sauces and gravies, and then hand-bread and cook our mozzarella sticks to order. This all takes extra time, but hope once you taste our food, you will agree the effort was worth it. If for some reason you are not satisfied with your meal, please let your server know and we will bring you something different out immediately. We are serious about guest satisfaction, and want you to leave happy and full.